LCMF, “the capital’s most adventurous and ambitious festival of new music” as named by The Guardian, took over a former carpet factory just off Brick Lane between March and May 2014 to offer two weeks of music, art and performance. 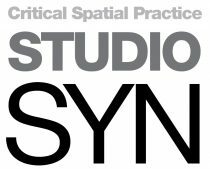 Studio SYN developed a spatial concept through an intense creative dialogue with the organizers and delivered the fit-out on an extremely tight budget and time scale. Brutal concrete interior presented an aesthetic inspiration and an acoustic challenge. Mezzanine balustrade organically extended the interior and comprised an unorthodox combination of a modular scaffolding system and blue yachting rope . The fit-out further included audience seating, bar area, lighting, stage set design, installing a unique 40 speaker sound system, and various acoustic and visual controls. Days before the fit-out for the festival began, I found myself on the site, with my bike, and the vast empty concrete interior echoing even the rolling of the bike tyres.